What does KATE ELLEN MAKEUP ARTISTRY offer a Bride? Quality is so important! Your wedding is the one day that you should look and feel your absolute best! Sometimes paying that extra 5-10 dollars per person makes all the difference in quality, Trust me it’s worth it! “I take pride in my work, I am a perfectionist when it comes to makeup application and I have an eye for attention to detail.” You will definitely get your money’s worth of professional makeup application and longevity. Fresh bridal makeup that will last well into the evening. Trust your instincts when looking at a Wedding Makeup Artists Instagram and website. You might see a couple of great images, but if you don’t love all of the images, than book someone that you know is consistently blowing you away! Kate has Trained with Kim Kardashians Makeup Artist Mario Dedivanovic and some of the best Makeup Artists in Australia. 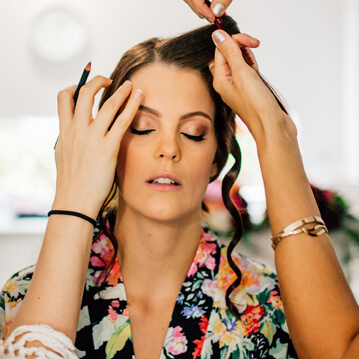 Kate also has many years of experience as a Bridal Makeup Specialist on the Sunshine Coast. You will have a professional that knows how to make the getting ready process as efficient and as stress free as possible! Kate is extremely versatile and can apply all styles of makeup, from natural to bold bridal looks! Whatever look a Bride is after, she will make it a reality. 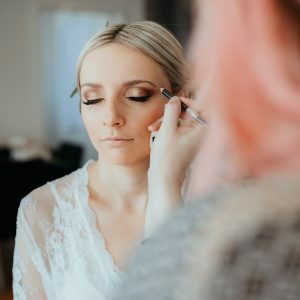 “My personal favourite wedding makeup style is NATURAL GLAM.” Making my brides look glamorous on their wedding day while still looking like themselves. Kate uses a wide range of the very best quality makeup brands. Your wedding makeup will last until the very end of the night and will not irritate your skin. Kate Ellen Makeup Artistry also has a variety of vegan friendly products in her Professional Kit. You are guaranteed Kate as your personal wedding makeup artist when you book with Kate Ellen Makeup Artistry. Kate is the sole makeup artist for her business so that she can maintain her fantastic reputation and offer premium bridal makeup application to every bride. A Wedding Makeup trial is essential to getting the exact look you are after for your wedding day. 60-90mins will be necessary for your wedding makeup trial to discuss colours, themes, skin care and of course the trial run of the makeup the application. 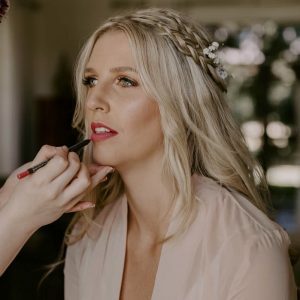 Kate from Kate Ellen Makeup Artistry will help you by using her years of wedding makeup expertise to create a bridal look that is perfect for you. Trials are held at Kate’s home in Buderim, Queensland which is very central and easily accessible to everyone on the Sunshine Coast. If you do not wish to have a trial that is completely fine, Kate will make sure that you have perfect wedding makeup on the day of your wedding. Kate Ellen Makeup Artistry uses predominantly MAC Makeup products but also has a range of Vegan friendly products. Kate Ellen Makeup Artistry does not use airbrushing foundation as it is not as high quality and as natural in face to face regards as her products. If you would like more information on Wedding Makeup trials or wedding makeup for the big day, please contact Kate Ellen Makeup Artistry today!